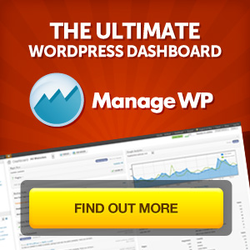 ManageWP has actually been designed by WordPress users, who anticipated the others’ needs even before they arose. What it does is to deliver users several innovative administrative options, which include backup, monitoring, all-in-one management, deployment, publishing, plus enhanced security features and many more. ManageWP – How can ManageWP help you? If time is your primary concern, then undoubtedly this little plugin is exactly what you need. By installing it you’ll be able to save plenty of hours which you would otherwise spend doing tedious tasks, and instead focus that time on managing things which are more important for you, such as your customers, your content, and your business. Another great thing about ManageWP is that it enables you complete to all the soliciting tasks with ease without requiring your constant attention and input. Once installed, the plugin will basically take charge of all the actions that need to be completed, and all you’re required to do is push one button for the actions to be done. If you own or need to manage more than one WordPress site, then this feature will definitely come in as handy. What it does is to grant you one-click access to all your WordPress sites, so whenever you click on one of them, you’ll be instantly logged in and given the options necessary for its management. No need to remember passwords anymore. Have you ever needed to update more than one theme or plugin but found it too time consuming and had to delay it? If so, then you’ll be more than glad to find out that ManageWP is able to do all the work for you with the simple push of a button. All you need to do is to review which of them need attention, press the update button, and then do whatever else you want until the plugin finishes its work. Simple, isn’t it? Even if you regularly need to deal with complex tasks which require solving, the tools included in ManageWP are sure to come in handy. What’s more, the console’ interface is very simple, yet modern, so you will probably figure the way in things need to be done right after installing it. With ManageWP, you don’t need an instructions manual anymore. The plugin makes use of the latest security and encryption standards which work in close relationship with WordPress, only to grant you that your websites are secure during the entire time when you use this extension. Also, a nice addition of this plugin is its integration with Sucuri.net, a leading platform when it comes to online protections against malware and other type of viruses. Thanks to this feature, you can check the health state of all your WordPress sites in one go, and then quickly fix any problems in case they show up. Backup also gets easy and smart with ManageWP. As you may know already, under normal circumstances your WordPress data can be gone in minutes. For this reason, a quality backup service is a must these days, and given this plugin’s complexity in this regard you’re granted to get even more than what you pay for. Once you make a backup with it, you have the entire control over its data. You can copy it wherever you want, and even upload it to your Dropbox, FTP or Amazon S3 in one go. You’ll hardly find any similar option on a competitor’s plugin. ManageWP provides its users with top-notch uptime monitoring tools, which enable website owners to check whether or not their business is running smooth at all times. In case anything goes wrong, the plugin is able to report back immediately. In addition, those interested in traffic management and analysis will find this plugin to be perfect for their needs. Regardless whether someone prominently links to you, your latest post gone viral, or your site is beign attacked by spam bots, ManageWP is able to tell you all these in real time, all whilst giving you the ability to closely monitor traffic spikes. It’s also to be noted that ManageWP features advanced integration with Google Analytics, for an even better and more customized reporting and direction tips. And if you’re worried about your website’s search engine ranking, then you should know that there’s a SEO module included as well, using a Manchester SEO company will help you in this regard at no extra cost. All in all, ManageWP truly makes a great option for those who are short of time and yet need to manage multiple websites at once. Even those who are not tech experts will find this plugin a breeze to use, and its options are more than likely to impress them as well.